have stood on the property. He has forgotten—or forgets to remember—exactly why he is here, what he did or didn’t do or think that has made him a ghost, and when he has slept for an unusually long time, he often has to roam the surrounding hills for a while until he can once again claim his bearings. That’s how he knows about the spirit of the lake. The above is an excerpt from A.M. Garner‘s new book Undeniable Truths, out now. From Amazon: The twelve stories that make up Undeniable Truths have an unmistakably Southern sensibility and are rich in humor, violence, wisdom, mystery, ghosts, dogs and troubled humans. The stories resuscitate stereotypes and reinvent the South. 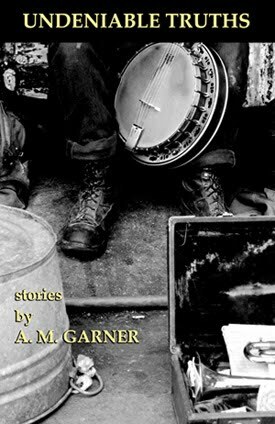 Born in rural Coosa County, Alabama, award-winning author A. M. Garner writes and teaches writing in North Alabama. She blogs about Southern culture at Talking in Accents online.